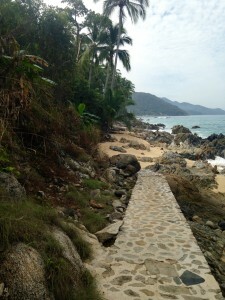 I came to Puerto Vallarta several times before I fell in love with it. Initially it represented an inexpensive, safe destination to satisfy kids during spring break – a quick fix for sun and sand. We stayed at “resorts” and swam in tepid pools. 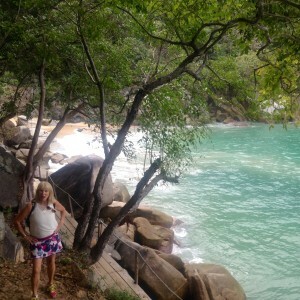 Then I met Margo Polo, paid attention and learned to get off the grid.Puerto Vallarta has some spectacular “off-grid” experiences. Here are my faves. 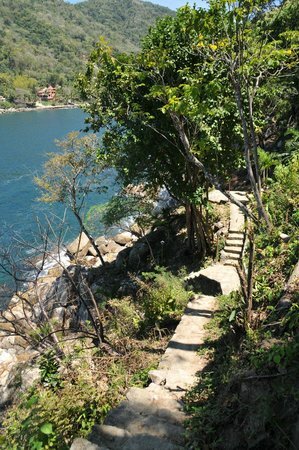 1) The hike from Boca de Tomatlan to Las Animas beach. It is certainly possible to do this hike on your own but a group, led by local yogi Barbara Crompton, does it regularly every Wednesday at 11 am. 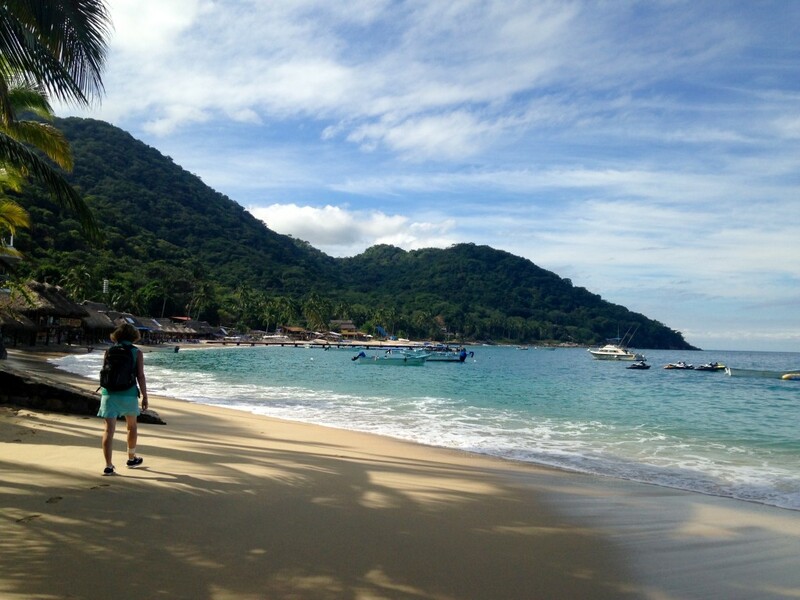 They meet outside Yoga Vallarta on Basillio Badillo at 10.15 am and catch the local bus to the quaint little seaside village of Boca – an adventure in itself. The hike is reasonably challenging in parts but can be accomplished in about an hour and a half over varied terrain. 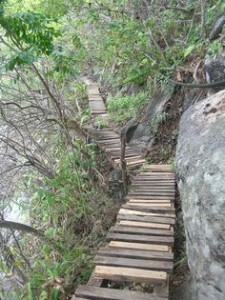 There are some steep climbs and descents, little wooden bridges over deep ravines and long sandy stretches of beach. The beautiful and abundant butterflies along the trail never fail to delight. Crompton collects 50 pesos from everyone once a season and this money is given to Javier who maintains the trail that could otherwise be quite treacherous. He has upgraded the little wooden bridges, installed handrails and rebuilds stone steps after each rainy season so that death traps like this to the right, no longer exist. 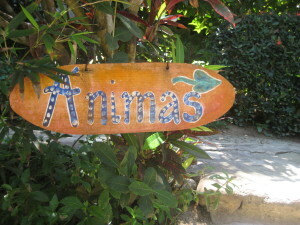 At the end of the trail lies Las Animas where hikers reward themselves with a few cold Cervezas or a margarita with lunch at one of the colorful little beachside restaurants. You can even cool down with a dip in the briny. A panga ride takes you back to Boca. This is a great way to keep fit and make a few friends on your holiday. 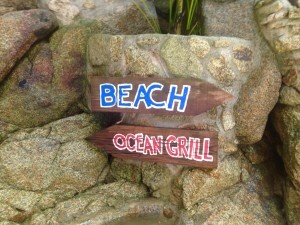 The Ocean Grill Restaurant and Beach Club is only accessible by the first half hour of the hike (above) or by boat. It is open for lunch only from Wed- Mon with 3 seating’s, 11:00am, 1 pm or 3pm. On-line reservations are a must. 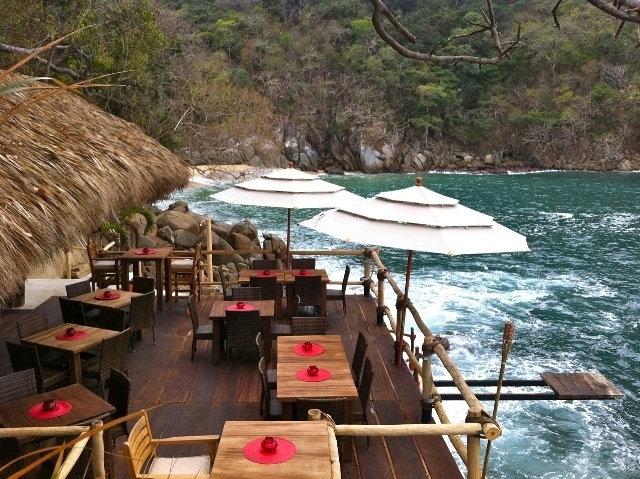 http://oceangrillvallarta.com Be sure to check their FAQ’s as there a few caveats for this wonderful experience. 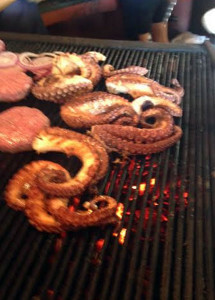 If you plan to do the full hike another day I would recommend getting to the Grill by boat. I never need an excuse for a boat ride. Otherwise a combination hike and return by boat is possible. The food is excellent, the setting sublime. We particularly loved the warm oysters in ginger brine. 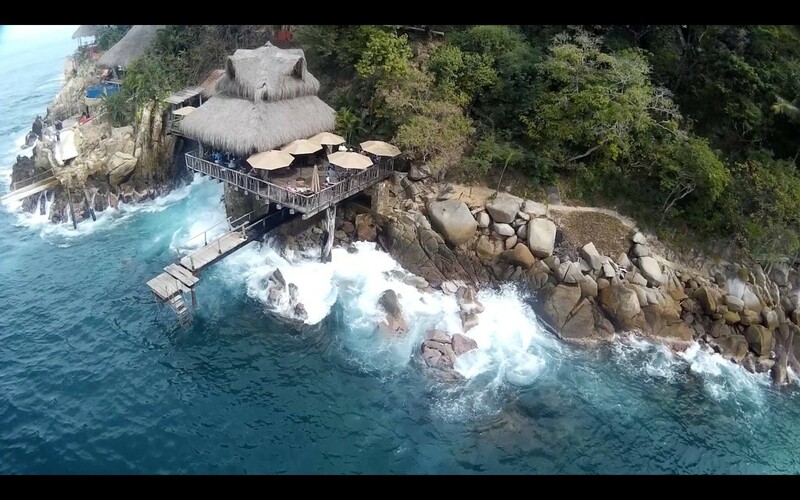 One of the most beautiful little beaches on Banderas Bay is right beside the grill – be sure to plan enough time for a refreshing dip before or after lunch. 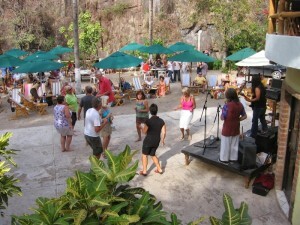 3) Gecko rocks the El Rio BBQ. 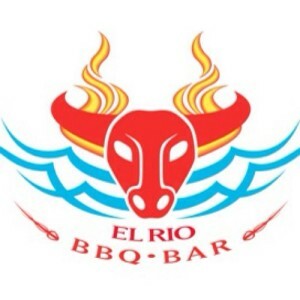 The EL Rio BBQ is located at Paso Ancho the River Cuale a short cab ride inland from Puerto Vallarta, but also easy to get to on the no.4 bus. It is also accessible via a delightful half hour walk along the riverbank and it is not uncommon to see groups of regulars making the pilgrimage every Tuesday and Friday evenings. Just follow the capri pants and floral tops and you will end up back in time dancing to cover tunes from the 70’s and 80’s – think Rolling Stones, Van Morrison, The Doobie brothers. You get the picture. 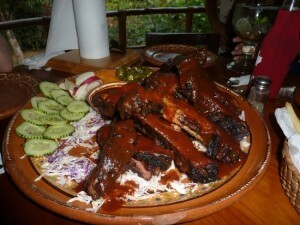 If a giant plate of BBQ ribs smothered in sauce is your idea of a great meal, this is the place for you, but we don’t flock to El Rio for the food. 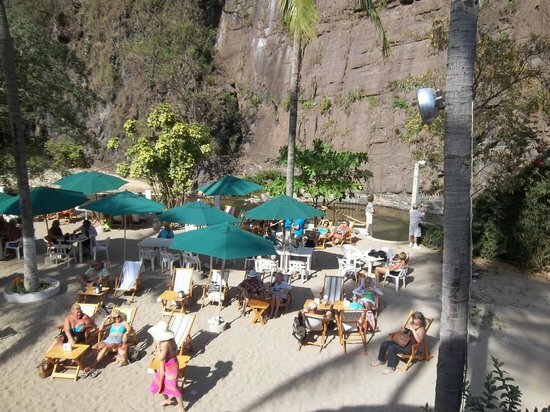 The live music is the main attraction with the burly Gecko band (classic rock and blues) rocking it on Tuesday evenings and a Zee Zee Top look alike, a Scottish pixie in red satin pajamas who plays a mean saxophone takes over on Fridays. 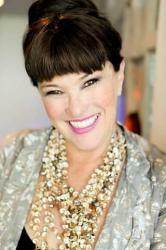 Live music from 4- 6pm, great for old timers who want to be in bed by 8. Order a Josephina Margarita (pronounced Ho-sephina) – one of the best margs in town.